Walk into The Royal Opera House in Mumbai and its ambience speaks volumes about its rich legacy. The erstwhile cinema hall’s new avatar became the talk of the city when it reopened last year. 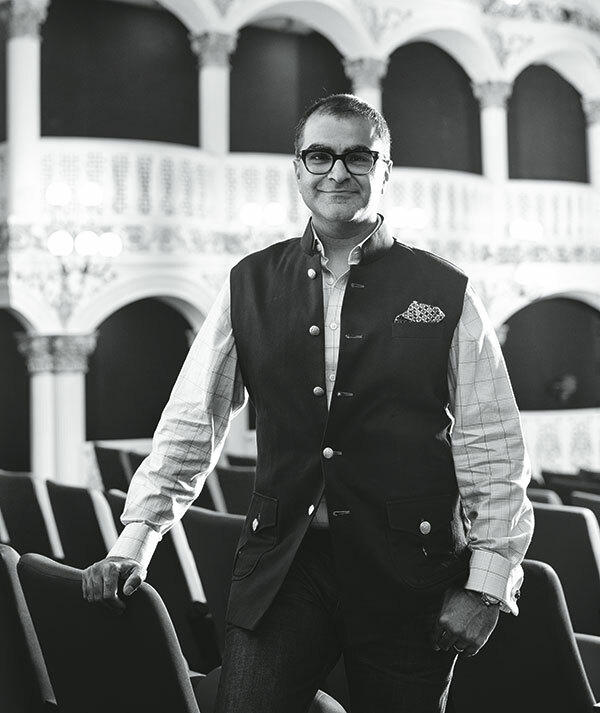 We walk into its hallowed portals to meet Asad Lalljee, the CEO of Avid Learning who, in one of his many avatars, is the curator of the Royal Opera House. The senior vice president of the Essar Group, after a 14-year stint on New York’s Madison Avenue as one the ‘Mad Men’ advertising executives, is a driving force on our cultural scene, planning several festivals and programmes. Lalljee moves in front of the camera for what is one of his rare photo shoots. He answers questions with an easy confidence and soon our talk takes a detour to touch upon his 352 pairs of cufflinks — and how his fascination for them started — his years as an adman, his routine that embraces quality time with his little daughter and his passion that has him interact with the best minds in the business, both nationally and globally. Would you say the term ‘cultural curator’ best fits what you do? We carefully blueprint each programme to uncover unique perspectives on the arts and take the conversation further. But I am not an academic, nor do I claim to be an expert. I think cultural ‘producer’ is more apt. I use my interest, passions and marketing experience to create events that are relevant and interesting to a particular audience. Is your lack of a formal background in the arts an advantage or a limiting factor? It gives me objectivity and neutrality. I put on my marketing hat and create programmes for a particular segment (you cannot be everything to everyone). It is more driven by passion versus agenda. What would you say is your vision for shaping the arts in a swiftly morphing society? We seek to invite more people into the conversation by deepening learning experiences through sustained partnerships and by diversifying our programming through new spaces, formats and approaches. We believe #learningneverstops. Change is inevitable in every society, especially the digital age we are living in. Can you tell us a little bit about Avid’s properties like the Multipolis Mumbai series and Roundtables? These two IPs examined Mumbai and its many cultural facets. Multipolis Mumbai I was a nine-part series of talks on architecture, music, food, theatre, fashion, environment, literature, innovation and film, paying special attention to industries’ influence on the city and vice-versa. The second iteration began last month, and decodes the past while looking to the future and finding novel ways of engaging, interacting with and re-energising the city that we love! A significant achievement last year was the reopening of the Royal Opera House under your aegis. What is your role in its new form? My curatorial vision positions it as not just a spectacular location and venue but more so as a proactive partner and catalyst in the propagation and revival of arts and culture in the city and for the city’s youth. Avid Learning has leveraged the space to engage more deeply with the cultural, business and diplomatic communities in Mumbai. We would like to have a memorabilia store, a cafe and art initiatives to visually energise, enhance and utilise indoor and outdoor spaces within the venue and to add robustness to the schedules. How are you using digital spaces for the promotion of your initiatives? In a changing world that is getting ever more digital by the day, we at Avid understand the need for engagement with a cultural community that is online and scattered around the world. Social media has enabled us to give access to any and all interested with ease. We regularly harness it to power and promote all our events be it through Facebook Live, Twitter chats, YouTube channels or Instagram posts. Recently, all our events have been accessed widely via Facebook Live streaming. Live interactions expand our outreach to new audiences and engage with our existing audiences on digital platforms. We also successfully engage with social media influencers such as Steve McCurry, Padma Lakshmi, Kala Ghoda Arts Festival and TEDxGateway. How do you feel the internet impacts cultural developments? The influence that social media and the internet have had is to bring diverse ideas and peoples together as part of a new narrative that is shaping a new global or glocal culture. The way we create and what we create is directly related to how we communicate. There are amazing initiatives like Google Arts and Culture Lab and others that further this development through democratic global access. To be an optimist, I look at it as more Opportunities To See (OTS) and consume culture. Do you feel that minds are opening up, with the exchange of ideas? A growing number of sociocultural initiatives, start-ups, and growth in engagement on social media have certainly opened up the exchange of ideas. We are creating and sharing cultural archives as well as collaborating to create content online and across boundaries. There is a whole new kind of community online.